(Fortune) -- The Securities and Exchange Commission on Friday charged Wall Street's most gilded firm, Goldman Sachs, with defrauding investors in a sale of securities tied to subprime mortgages. The SEC said it charged New York-based Goldman (GS, Fortune 500) and a vice president, Fabrice Tourre, for their failure to disclose conflicts in a 2007 sale of a so-called collateralized debt obligation. Investors in the CDO ultimately lost $1 billion, the SEC said. 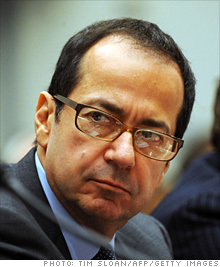 Hedge fund manger John Paulson. The SEC's civil fraud complaint alleges that Goldman allowed hedge fund Paulson & Co. -- run by John Paulson, who made billions of dollars betting on the subprime collapse -- to help select securities in the CDO. Goldman didn't tell investors that Paulson was shorting the CDO, or betting its value would fall. When the CDO's value plunged within months of its issuance, Paulson walked off with $1 billion, the SEC said. "The product was new and complex but the deception and conflicts are old and simple," said Robert Khuzami, director of the Division of Enforcement for the SEC. Goldman said Friday morning that "the SEC's charges are completely unfounded in law and fact and we will vigorously contest them and defend the firm and its reputation." After the market closed, the firm added that it is "disappointed that the SEC would bring this action related to a single transaction in the face of an extensive record which establishes that the accusations are unfounded in law and fact." Goldman said it lost $90 million on the deal. The firm added that it never told the portfolio arranger, ACA Capital Management, that Paulson's fund was going to purchase an equity interest in the CDO, as the SEC alleged. Goldman shares tumbled 13% following the midmorning announcement, wiping out $12 billion of shareholder value. Shares of Deutsche Bank (DB), another big player in the structured securities markets of the bubble era, slid 8%. The shares of JPMorgan Chase (JPM, Fortune 500), Citigroup (C, Fortune 500), Morgan Stanley (MS, Fortune 500) and other big banks declined between 3% and 5%, as investors all over Wall Street heard the footsteps of an apparently revitalized federal law enforcement apparatus. "This litigation exposes the cynical, savage culture of Wall Street that allows a dealer to commit fraud on one customer to benefit another," Chris Whalen, a bank analyst at Institutional Risk Analytics, said in a note to clients Friday. Khuzami said the case was the first brought by a new SEC division investigating the abuses of so-called structured products such as CDOs in the credit crisis. He said the investigation continues but declined to comment further. "We continue to examine structured products that played a role in the financial crisis," Khuzami said in a phone call with reporters. "We are moving across the entire spectrum of products, entities and investors that might have been involved." The SEC alleged that Paulson & Co. paid Goldman Sachs approximately $15 million for structuring and marketing the deal, known as Abacus 2007-AC1. Khuzami said Paulson wasn't charged because, unlike Goldman, which sold the securities to investors, it didn't have a duty to fully disclose conflicts to other investors. In a statement, Paulson & Co. said that it "is not the subject of this complaint, made no misrepresentations and is not the subject of any charges." A CDO is a financial instrument backed by pool of assets, typically loans or bonds. In this case, the instrument in question is a so-called synthetic CDO -- which is backed not by actual loans but by a portfolio of credit default swaps referencing residential mortgage-backed securities. While many CDO deals performed poorly, particularly in the latter stages of the housing bubble, the Abacus CDO at the center of this case blew up particularly quickly. Within six months of the deal's closing, 83% of the residential mortgage-backed securities in the portfolio had been downgraded, the SEC said. Within nine months, 99% had been downgraded. Khuzami said the SEC is entitled to disgorgement of ill-gotten gains as well as penalties that will be considered "at the appropriate time." But it's early yet to say whether Goldman will end up with any liability in the case, said Ron Geffner, a former SEC enforcement attorney who is now a partner with Sadis & Goldberg in New York. He said the case would hinge on variables including the objectivity of the portfolio designer, what was communicated to investors, what fiduciary duties Goldman may have had and how sophisticated the investors were. "There is some meat on the bone, but it's too early to determine guilt," he said. Will Goldman Sachs customers start walking?